Destination development is the strategic planning and advancement of defined areas to support the evolution of desirable destinations for travellers, with a sole focus on the supply side of tourism, by providing compelling experiences, quality infrastructure, and remarkable services to entice repeat visitation. Destination BC offers destination development planning assistance, in partnership with Indigenous Tourism BC, the Ministry of Tourism, Arts and Culture, and Regional Destination Marketing Organizations, to support the ongoing viability of BC’s tourism sector. Across the province, multiple 10-year destination development strategies are being created which will inform six regionally specific strategies. In turn, these strategies will then inform the creation of a single provincial destination development strategy. By working together with local, regional and provincial agencies, Indigenous communities, destination marketing organizations (DMOs), industry organizations, and tourism operators, the strategies will guide the long-term growth of tourism experiences and revenues within the province. Through destination development, we envision BC as a world-class tourism destination which offers remarkable products and experiences that are authentic, driven by visitor demand, and exceed expectations. Make British Columbia the most highly recommended destination in North America. Create strategic plans for tourism development and improve return-on-investment for government and private sector investments in tourism assets. Elevate British Columbia’s ability to compete as a premium destination while making the province more attractive for investment. More information about the Destination Development Program can be found on the Destination Development Overview information sheets. Destination BC continues to work with communities across the six tourism regions to develop destination development strategies that pull together planning, policy, and capacity building efforts. You will soon be able to explore how each of the tourism regions are working together, and with various partners, to address impediments to tourism growth and strengthen relationships to capitalize on future tourism opportunities. "The Destination Development planning process has greatly contributed in confirming what the main challenges and opportunities are in developing the Kootenay Rockies region as a prime travel destination. It also helped us forge new partnerships with organizations that were not engaged directly with tourism before, and strengthened relationships amongst the stakeholders of the different planning areas, particularly along the Highway #3 Corridor." "The 20-member volunteer working committee travelled considerable distances to meet in Fort St John for the Destination Development planning sessions. These sessions helped to bring together a diverse group of organizations to share their best ideas about the future of tourism for our region. A topic that was new to many but embraced by all was the importance of increasing the presence of facilities, infrastructure and services that support universal design." "The 20-member volunteer working committee travelled considerable distances to meet in Fort St John for the Destination Development planning sessions. These sessions helped to bring together a diverse group of organizations to share their best ideas about the future of tourism for our region. A topic that was new to many but embraced by all was the importance of increasing the presence of facilities, infrastructure and services that support universal design. As an initial step, Northern BC Tourism signed a Memorandum of Understanding with Spinal Cord Injury BC." "The Destination Development Program has provided opportunities for increased partnerships within the tourism sector. One such example is the collaboration between the educational institutions, the local DMOs and the planning committees to work with students and young professionals in order to implement tourism development goals." "The Destination Development Program has provided opportunities for increased partnerships within the tourism sector. One such example is the collaboration between the educational institutions, the local DMOs and the planning committees to work with students and young professionals in order to implement tourism development goals. Another benefit of the process: Destination BC, Indigenous Tourism BC, and the Thompson Okanagan Tourism Association are working with Indigenous communities to promote local artisans through the Artisan Trail initiative." 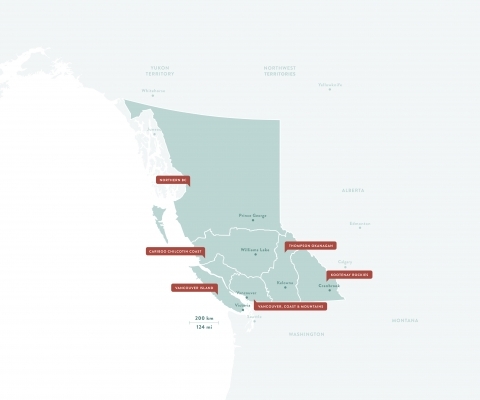 "In the Vancouver Island region, the Destination Development Program has inspired and enabled communities to work more collaboratively in pursuit of a more sustainable, competitive and remarkable destination. Southern Gulf Island communities aim to dramatically improve island to island travel, while other communities like Parksville Qualicum Beach are moving towards their goal of having a comprehensive tourism master plan." "In the Vancouver Island region, the Destination Development Program has inspired and enabled communities to work more collaboratively in pursuit of a more sustainable, competitive and remarkable destination. Southern Gulf Island communities aim to dramatically improve island to island travel, while other communities like Parksville Qualicum Beach are moving towards their goal of having a comprehensive tourism master plan. Beyond these two local examples, tourism partners across the Vancouver Island region have accepted the challenge of working together to ensure the long-term success of tourism businesses, to help grow communities and to strengthen the warmth of our welcome as a preferred travel and getaway destination." Through the Destination Development program, we've confirmed opportunities to grow collaboratively, share collective voice, and reach common goals. The diversity of our region will be protected and amplified as we grow responsibly and purposefully. As stewards of our tourism assets, we ensure the stretch of local ‘watchmen’ and ensure true sustainability for generations to come. The Destination Development Program has provided a forum for us to work collaboratively with a variety of partners to identify challenges and opportunities and to create a clear ‘road-map’ for joint action in developing the long-term competitiveness of the tourism sector within the VCM region. Sunshine Coast communities aim to improve transportation to and from the coast, while communities along the Sea-to-Sky Corridor are focused on visitor growth management and elevating sustainable tourism practices. The Province has approved a one-year $7.5 million renewal of the program, which supports live music events in BC, industry development, and artists' career development. The fund not only serves to develop BC's music industry, but also helps attract visitors and grow BC tourism. Coastal communities are benefiting from improved ferry services, including a 15% fare reduction on smaller and northern routes, 2,700 additional round trips a year, free Monday to Thursday passenger travel for seniors, and a fare freeze on major routes. The Morden Colliery, originally built in the early 1900's, is an important piece of Vancouver Island's coal mining history, and one of only two remaining structures of its type in North America. After stabilizing and repairing the structure, plans are underway to connect it to Hemer Provincial Park via a multi-use trail. The Provincial Nominee Program (PNP) Entrepreneur Immigration Regional Pilot aims to attract international entrepreneurs to establish businesses in regional communities. Through the program, experienced entrepreneurs and high-demand foreign workers can gain a permanent path to citizenship. The new long-term deal guarantees Norwegian Cruise Lines a Pier-A South Berth at Ogden Point through 2030. The harbour authority says that the long-term certainty could attract capital investment, and allow businesses working with the cruise industry to plan for the long-term. The government of BC is providing $18.6 million in one-time funding to ground search and rescure groups (GSAR), to be used over the next three years. The new funding, supplemental to the $9 million already provided for operational costs, will provide administrative support, allow for equipment renewals, and bolster training. 26 communities in the Kootenays will be receiving improved high-speed internet, thanks to $4.8 million in provincial funding. Utilizing the funding, the Columbia Basin Broadband Corporation (CBBC) will be installing 125 kms of fibre-optic infrastructure, allowing faster and more reliable internet service for residents in the Slocan Valley and South Country areas. The First Peoples Hopitality Program, which couples 18 weeks of occupational skills and employability training with 6 weeks of on-the-job experience, aims to provide a career path in the hospitality industry for up to 20 local young Indigenous adults. Local inns and hotels have partnered with the program to ensure that participants will have job opportunities upon completion of the training. A new memorandum of understanding between Indigenous Tourism BC (ITBC) and the Cariboo Chilcotin Coast Tourism Association (CCCTA) seeks to promote the growth of Indigenous tourism in the region. Through collaboration, both parties hope to develop new tourism experiences and build a sustainable visitor economy. In a historic new agreement with the provincial government, First Nations communities will receive 7% of the total provincial gaming revenue for the next 25 years, providing a stable and long-term revenue source for community investment.